Teaching our children about the cycle of life without scaring them about death. My children had their first lesson experiencing death this month. I have always been told that death comes in 3’s, but this story is almost too much to believe. It started in our own home with our sweet dog Rascal, and then progressed to the next 2 houses. Rascal had clearly been nearing the end of his life cycle the last year or so. We have been trying to prepare our girls, but mentioning it would just make them cry and scared. My girls had never had any experience with death and it was hard to know how to approach it, but I did not think ignoring it was in the best interest of my kids. Preparing your children for death is a rare opportunity to learn about death and grieving. As Rascal has been slowly failing the last few months, my husband and I started letting our kids know that Rascal did not have much time left, but often they would burst into tears and tell me I was mean. Even though it upset them, I thought it was important to talk about death so it was not such a shock when he died. I thought teaching them about the cycle of life first hand was important for their own growth. It was hard to decide to face it instead of ignoring it. It would certainly have been much easier to just ignore it and put Rascal to sleep one day when they went to school and lie and say he had died. But as hard as it was to start preparing them, I thought it was a good chance to experience death and grief as a family together. As Rascal had slowed down more and more, it had become harder and harder for him to get up and go outside. The girls were starting to see that his quality of life was greatly diminishing. When the girls and I went up to SF for spring break, my husband warned them that if his time came, he would have to do it while we were away. But we were relieved to come home and find Rascal wagging his tail in his usual spot by the window when we came inside. A week and a half after our SF trip the girls and I came home and we saw that Rascal had made a turn for the worse. My kids saw for themselves that it was time. It was important to have a conversation that as much as we wanted him here with us, we did not want him to suffer. For the first time they heard him suffering, and the realization came that the humane thing to do was to put him to sleep. My husband came home that night and we talked about it. When we saw Rascal in the morning we knew that was the day. I wanted my girls to have input on how much they participated in the process of putting him to sleep. We asked the girls if they wanted to be there and they did. So that night, I planned to have my wonderful friend and vet Dr. Fina Flores come over to help us. 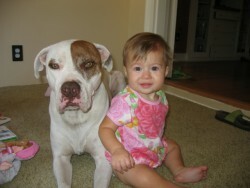 Putting to sleep a dog that helped raised my girls was devastating for my family. Our babysitter Annette, who is like a member of our family, was there and helped us with Rascal to the end. I felt my girls were old enough to make choices about how much they were present or not through this process. I wanted to empower them to make choices that they were comfortable with to aid them in the grieving process and to respect whatever they decided. 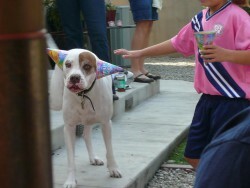 We came home from dance classes that night and spent about an hour crying and saying good bye to our buddy Rascal. Ultimately, the girls decided they did not want to be there when he was given the first shot, but they came out of their rooms with Annette after to say a final good bye. It was very sad and quite honestly devastating to see my kids and husband so sad. My oldest daughter did not want to let go, but she finally accepted it was time. They left the room when Dr. Flores gave him the final shot that peacefully put him to sleep. There is a grieving process for a dog, just like humans. There has been a definite grieving process for Rascal. Even a few weeks later it is hard for us all to believe he will not be at his window welcoming us home. But as hard it was, we all feel better that he is not suffering. We have been talking about it, sharing our emotions and processing our grief together. I feel I did the right thing for my family. We shared some very sad days as a family, but by choosing to go through the pain and a tough situation together, I think our family gained strength and support by going through it together. Then I saw the hospice truck go to my next-door neighbor’s house. A few days after Rascal had passed, I saw the hospice van pull up to my next-door neighbor’s house. A day later I saw her daughter and asked if her mom was ok. After bravely fighting cancer for 17 years, she told me that her mom was at her end. We were not close, but I was sad to hear it. She made a comment that her mom was just starting to be in pain and wished she could be put down like a dog. I then explained what we had gone through with Rascal and we had a conversation about no one wanting to see suffering. My neighbor died 2 days later. I thought it was crazy she went 4 days after Rascal and thought again how death can come in 3’s. My girls once again got to learn about death. They witnessed what life can be like at the end when they saw the hospice people come back and take away all the stuff she had been using at the end of her life. Then I saw my neighbor from a few houses down. I had to tell my kids about a third death in one week. (6 days to be exact.) They now understood that we do the compassionate thing when we can. I know that these deaths were not a surprise, as my neighbor was at the end, and both dogs as well. But 3 deaths in one week, and 3 houses in a row was quite a jolting lesson in the cycle of life. I am glad I was able to share the experience with my family and able to talk to my girls about the cycle of life and experience grief with them. This is a tough lesson to learn, but since its part of life, I am grateful for this experience, like so many other family experiences. When death comes up in your family, you will have to decide the best way to handle it. I want to wrap up this blog by clarifying that I don’t know how you should handle grief in your family, but only to say please do what you feel is right for your family when the time comes. I am a big believer in following my gut. I have always used my gut as a major indicator on how I make decisions. My intention is never to tell anyone how to live their life, but instead to share my experiences and see if they resonate with yours. I am a story teller and maybe an over sharer, but I think we have so much to learn from each other and our experiences and one of my goals in life is to keep learning. I hope you will share my blog, or leave comments so I can continue to learn and share with all of you.